It’s hard to find original recipes. Let’s face it… there’s only so many ingredients in the world and since I get 8 cooking magazines a month and about 30 cooking-related e-mails a day, I’ve seen a lot. So when I see something different and interesting, I get a little excited. Allrecipes had a Brandied Shrimp with Pasta. White wine and brandy? Hmmm… I’m curious. Then there was Pillsbury’s Beer-Cheese Mac and Sausage that blends macaroni and cheese with cocktail sausages and popcorn. Tell me that doesn’t sound delicious. However, the recipe I kept going back to was from Kraft. A basic Jalapeno Poppers recipe, but as I looked at the ingredients, it had bacon. BACON!!! Oh Kraft, you just get me. Around this time of year, I start craving sandwiches. Specifically, BLTs. I have no idea why. So color me excited when I saw Food Network’s recipe for BLTs with Blue Cheese-Buffalo Aioli. It blends two of my favorite things – BLTs and Buffalo Wings. As a side note, they also had a recipe for BLT Hot Dogs which upon inspection looked really GROSS. I was very intrigued by Swedish Doughnuts recipe from Taste of Home. These cinnamon and sugar sprinkled donuts have Mashed Potatoes in them. Mashed Potatoes? I don’t know how I feel about it, but if anyone either makes them or has tried them, let me know. I always look for recipes that are easy to make and can feed a lot of different tastes. That way, if someone stops by or I have a last minute guest, I have something to feed them. That’s why my favorite recipe from this bunch is the Build-Your-Own Shish Kabobs from Food Network. Give them the protein and veggies and let them create their own combinations. I also love Potato Chip Cookies. Real Simple almost got me with their recipe. My poor grill has been stashed away far too long. It is time to pull that baby out and try some of the delicious recipes I found hiding in my e-mail. I can’t wait to try the Hamburquesas Mexicanas – pepper-jack stuffed burgers topped with guacamole and salsa – but I’m really excited about the Garlic Lover’s Grilled Corn and Garlic Steak with Garlic. You may not be able to be around me for a couple of weeks afterward, but I’m not really a people person anyway. Yes, I am alive. My business that brings me money has exploded, so between that and the Chicago Blackhawks… well I’ve been swamped. One thing I know for sure is that it is grillin’ season! I’m more than excited to pull out the grill, marinade some beef, chicken, pork and seafood, and do some outdoor cooking. There are some intriguing recipes in this collection: some cute desserts from Betty Crocker and baby food recipes from Parents Magazine. However, I was most attracted to the Baltimore-Style Crab Cakes from Food and Wine Magazine. I used to live near Philadelphia and used to drive down to Baltimore only to eat crab. When I visit the region, I try to eat my weight in crab (and usually succeed). This day my InBox was crammed full of fish taco recipes. If you've ever had a good one (and frankly I haven’t found any that rival those I ate in Southern California) you’ll want to read this post. Another note: According to Land o’ Lakes, they donate money to Feeding America each time you pin or re-pin a recipe from their site. A good cause, no? And all you have to do is PIN… and you know you want to pin. Come on, do it! Happy Easter everyone! I’ve got about 5000 recipes sitting in my InBox from as long ago as May of 2012 and I just realized, they are perfect for this time of the year. Spring is approaching as is warmer weather, grilling and seasonal fruit and vegetables. As I clear out my e-mail, I’m posting the ones that I’m interested in trying! I’ve got about 5000 recipes sitting in my InBox from as long ago as May of 2012. As I clear out my e-mail, I’m posting the ones that I’m interested in trying! 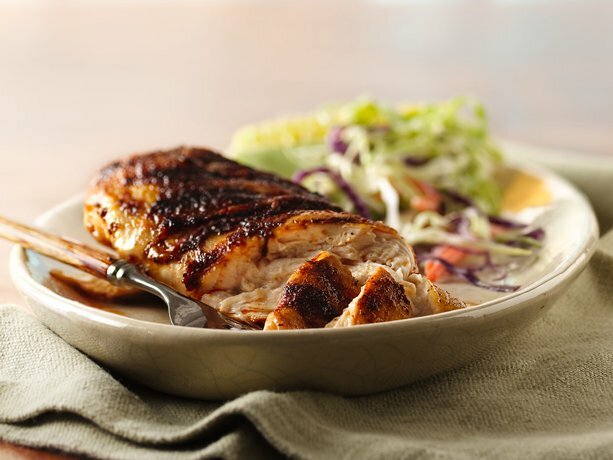 The warm weather has returned to the Midwest, so grilling recipes are perfect for dinner! Haul out the grill and take advantage of it. Some of these use the grill. If you live in the Midwest, you may have to dig yours out from under, oh let’s say, 10-inches of snow. Still, I know people who have grilled in snowstorms before, so I’ve decided to send these along anyway. Interesting enough, until today, the grill recipes could be useful since it was 60-degrees in the Chicagoland area. As I get ready to post some of these yummy grill recipes, the temperature dropped and it is snowing like crazy. Keep these in your archives for better weather and if you live in the Midwest, you know that better weather could be tomorrow. This month in Good Housekeeping (January 2013), they scrutinized the labels on chicken*. They went through the buzz-words frequently found to help you determine if it is worth the extra money that usually accompanies these terms. * I'd link to the actual article, but alas, I couldn't find it on-line. Chickens can run around outdoors, but there isn't any guarantee that they actually did. My Rating: $$ - I'm going to have a little hope that if they had access to the outdoors, they ran around instead of being crammed into cages where they aren't allowed to move all. Also keep in mind that the USDA only requires outside access, not necessarily the ability to move around without fencing, a specific outside size area or a certain amount of "exercise time" for them. Yeah, this means diddly-squat. There is no USDA oversight to this terminology and some that have been labeled as "natural" have been injected with antibiotics. My Rating: $ - It's simply a marketing term with no meat behind it. Just a reason to charge more money. The practice of injecting hormones into US raised poultry is illegal... and has been since 1959. My Rating: $ - If this is all they can come up with, spend your money elsewhere. All chicken is hormone free, so don't pay extra for this on the label. One of the only terms actually regulated by the USDA, the farm must prove that the chickens eat only organic food and raised without any antibiotics or other injections. My Rating: $$$ - This is the real muscle of the industry since it is regulated. Not only do the poultry farmers have to prove that they are up to standards, but the feed providers need to prove THEY are up to standards... for SEVEN YEARS. Similar to Free-Range, this definition can be loosely interpreted because of the term "raised". It refers to only what happens after the chicken has been hatched. My Rating: $ - According to Good Housekeeping, a company injected the eggs with antibiotics before they were hatched, so I wouldn't put much faith in anyone using this terminology. If you don't think that ANY of these terms make a difference, let me share a story with you. I was making dinner for family once and went to Whole Foods for organic chicken. At the last minute, I found out more people were going to be coming, so I scooted out to the closest grocery store and bought their fresh chicken. When cooking, I sectioned the chicken off to make sure I fed "the good stuff" first. Just as I expected, we ate all of the organic chicken and someone wanted another helping. He ate the chicken and then asked me if I had done something different to the last batch. He said it didn't taste "bad" but it tasted different. When I told him what was different, he said that it didn't taste as fresh or juicy. So keep that story and these terms in mind next time you are out shopping for chicken. And remember, you don't have to be having people over to get the best. You deserve the freshest and most delicious food even when you're eating alone.